Design Classes at Butterbee Farm! We are beyond excited to announce an upcoming collaboration with our friends at Butterbee Farm! This summer, Local Color Flowers will be offering two design classes AT Butterbee Farm in Pikesville. What could be more fun…visiting a flower farm, meeting the farmer, cutting and choosing your own flower and learning to create beautiful designs with those flowers! Our second class will be our Down on the Farm Summer Centerpiece Class. The farm will be in full swing in August and all our attendees will choose blooms, herbs, and foliage to create a beautiful centerpiece to take home. Sign up today! Happy Summer! Baltimore’s Best Local Flower CSA! Summer is around the corner and Local Color Flowers local flower CSA will be starting in just two weeks! We’re so excited for this year’s CSA! Here’s how it works. Sign up today and pay $250 for 10 beautiful local flower bouquets over the next 5 months! 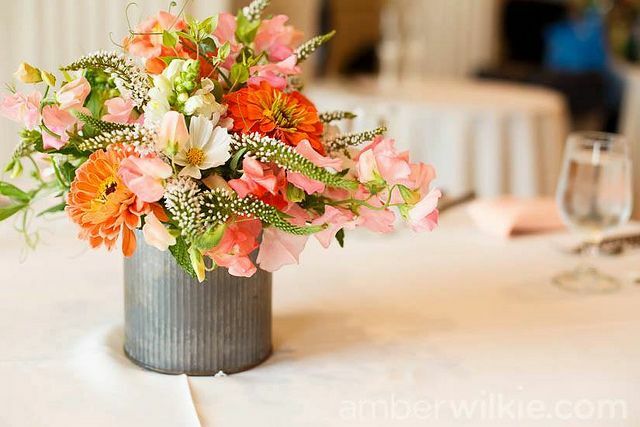 Pick-ups are at Local Color Flowers studio located in Charles Village at 3100 Brentwood Ave between 4:30-7pm. Pick up dates are: Jun. 4, 18; Jul. 9, 23; Aug. 6, 20; Sep. 3, 17; Oct. 1, 15 2014. This year, we’re excited to add a new feature to the CSA! Each week after you pick up your wrapped bouquet, you can check out our blog for a new post all about the flowers in your bouquet, the farmers that grew them and how to arrange them when you get home. We can’t wait to share this with you! We’re also offering a short, one hour CSA “design” class that will give you tips about how to care for your CSA flowers when you bring them home. The class will take place Wednesday, May 28, 2014 from 6-7pom. Sign up today! We’re so excited to see you all for the first pick up on June 4th! Last week we took a field trip to Baltimore City flower farm, Hillen Homestead. Hillen Homestead, run by Maya Kosok and her lovely husband Max and their adorable baby girl, is literally just 2 miles from Local Color Flowers studio. Do you know how lucky we are to have a flower farm so close by? VERY lucky! Hillen Homestead is located in central Baltimore City on a vacant lot where rowhomes used to stand. It’s not gigantic and it’s not overly picturesque…but man is is productive! It’s a perfect example how urban farming can be a great option for small flower farmers. This will be our second year buying from Maya and we couldn’t be more excited. Carling and Stacy started by tilling beds and spreading compost from Chesapeake Compost Works. I planted lots and lots of basil…and ageratum and zinnias. We passed our time talking about flowers and farming and designing and business. What could be better? It was a fun morning for all of us. Not only did we get to spend a day outdoors helping our friends, we also got to have a direct hand in the flowers we’ll be using this summer. It was another amazing way to connect with our farmers and the flowers they are growing. Thanks so much to Maya and Max for letting us come help. Happy Spring and Happy Planting friends! Mother’s Day is just around the corner and there are SO many great options for gifts involving locally grown flowers this year! Moms love flowers (doesn’t everyone??)! Order your Mother’s Day bouquet or arrangement today! All bouquets and arrangements are made with locally grown cut flowers from farms within 100 miles of Baltimore! Delivery is available in Baltimore City on Friday May 9. You can also pick your order up at our Charles Village Studio Friday from 9-5pm and Saturday from 8am –noon. While a single arrangement is awesome, maybe your mom would like the gift that keeps on giving! A subscription to our 2014 Local Flower CSA! The CSA begins in June. Members receive 10 bouquets over 5 months. It’s an amazing way to experience the changing of seasons with flowers! If your mom really loves flowers, how about signing her up for one of our design classes! Attendees get to learn more about locally grown flowers along with designing an arrangement to take home and enjoy. If you’re out and about and want to pick some flowers up on the go this week, Carling will be out at the Union Memorial Farmer’s Market this Wednesday from 11am-1:30pm. This is a great opportunity to pick up a wrapped bouquet, a locally grown plant and much more. Our friends at Chesapeake Wine Company in Canton will also be selling wrapped bouquets starting Thursday afternoon. These babies go fast so be sure to get over there early! 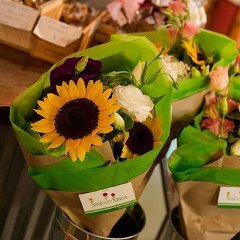 Beginning Friday, Green Spring Station Celebrates Mother's Day with complimentary local flowers from Local Color Flowers. Stop in any boutique and receive one beautiful stem – shop many stores and make a collection or, enjoy just one. One per customer at each store and available while supplies last Friday and Saturday (May 9 and 10). Like I said…lots of great options! Happy Spring! When Seaberry Farm mentioned yesterday that they had single peonies available this week, I knew right away that these were Mel’s peonies. We miss Mel too… but today especially, I’m thrilled to have our first peonies of the season be Mel’s peonies.